Went to the Mata household in Lancaster over the weekend for a family photo session for Meno and Betty and had a great time! 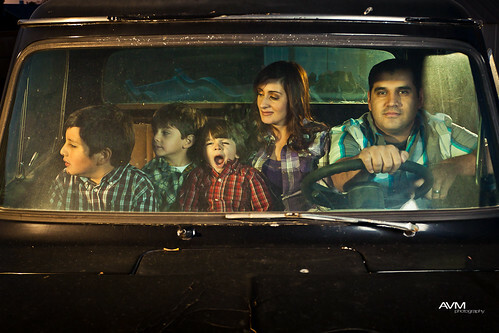 We figured we could do some fun shots inside Meno's old Ford pickup with the whole family involved. While shooting I figured it would be fun to make it look like a movie and pretend that they were driving somewhere. So we set up the lighting and popped a couple. The 2 kids to the left were good actors because what they're actually looking at is just a plain brick wall. I got lucky with the smallest. For all the photo geeks out there I shot at ISO 400 @ 1/60 f/5.6 25mm. 3 lights were used: 1 Bowens GM500 set @ f5.6 w/medium softbox camera right, 1 580EXII gelled w/full CTO, set @ ¼ camera left, and 1 580EX gelled w/full CTO, set @ 1/16 camera right behind the truck.